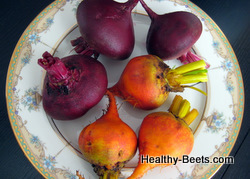 Yellow, or golden beets, are not as common as red beets, and are harder to find. But they are a bit milder and, some say, taste sweeter. There is also no mess associated with preparing yellow beets, no red juice on hands or counters. When cooked, they will take on a beautiful deep golden, or orange color. Roast yellow beets in olive oil and serve simply, tossed with a little salt, pepper and vinegar. 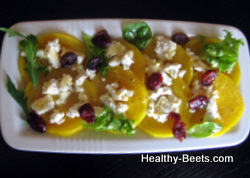 Or, try this easy salad of boiled yellow beets - it requires minimal cooking and makes a very attractive appetizer. Wash beets and cook without peeling in boiling water and a little vinegar, until the blade of a knife pressed them easily, which can take 30-60 minutes depending on size. Cool slightly and peel by rubbing gently with fingers. Slice thinly and divide among 4 plates, or make 36 appetizers. Garnish with sliced or crumbled cheese, micro-greens, and sprinkle with pomegranate seeds, or cranberries. Mix the mustard, vinegar and poppy seeds. Season to taste, and serve over the salad of beets.